I’d worked especially hard the previous two months: So much so that July and August were record traffic months for KrebsOnSecurity, with several big breach stories bringing more than a million new readers to the site. It was time to schedule a quasi-vacation, and this was the perfect excuse. I had a huge pile of frequent flier miles burning a hole in my pocket, and I wasted no time in using those miles to book a hotel and flight to Cancun. There are countless luxury hotels and resorts in Cancun, but it turned out that the very hotel I picked — the Marriott CasaMagna Hotel — had an ATM in its lobby that was beaconing the Free2Move signal! I had only just arrived and had potentially discovered my first compromised ATM. 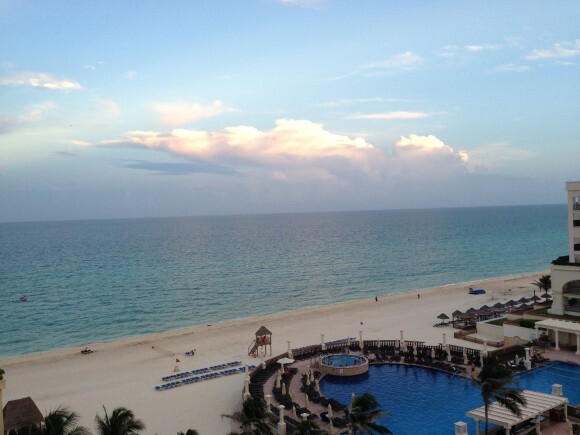 View from the Marriott CasaMaga Hotel in Cancun. However, I noticed with disappointment that for some reason all of my Apple devices — an iPhone 5, a late-model iPad, and my Macbook Pro — had trouble reliably detecting and holding the Free2Move signals from one of the two ATMs situated in the hotel lobby. I decided that I needed a more reliable (and disposable) phone, so I hopped in the rental car for a quick jaunt down the road to the local TelCel store (TelCel is Mexico’s dominant mobile provider and a company owned by the world’s second-richest man — Carlos Slim). After perusing their phones, I selected a Huawei Android phone because — at around USD $117 — it was among the cheapest smartphones available in the store. Also, the phone came with plenty of call minutes and a semi-decent data allowance, so I could now avoid monstrous voice and data roaming charges for using my iPhone in Mexico. Tourist attractions next to Plaza Caracol. Nearby the TelCel store was Plaza Caracol — a mall adjacent to a huge tourist nightlife area that is boisterous and full of Americans and Brits on holiday. The car parked in the mall’s garage, I pulled out my new Huawei phone and turned on its bluetooth scanning application. The first ATM I found — a machine managed by ATM giant Cardtronics — quickly showed it was beaconing two Free2Move signals. Returning to the Marriott hotel, I found that the two Free2Move bluetooth signals showed up consistently and reliably on my new phone’s screen after about 5 seconds of searching for nearby bluetooth connections. The compromised ATM in the hotel also was a Cardtronics system. At this point, I went to the front desk, introduced myself and asked to speak to the person in charge of security at the CasaMagna. Before long, I was speaking with no fewer than six employees from the hotel, all of us seated around a small coffee table overlooking the crystal-blue ocean and the pool. I explained the situation and everyone seemed to be very concerned, serious, asking smart questions and nodding their heads. A man who introduced himself as the hotel’s loss prevention manager disclosed that Marriott had recently received complaints from a number of guests at the hotel who saw fraud on their debit cards shortly after using their ATM cards at the hotel’s machine. The loss prevention guy said the company responsible for the ATM — Cardtronics — had already sent someone out to review the integrity of the machine, but that this technician could not find anything wrong. That same day, I phoned Giovanni Locandro, senior vice president of North American business development at Cardtronics. He told me the company conducts periodic “sweeps” in Mexico to look for skimming devices on its machines and that it was in the process of doing one at the moment down there, although he didn’t acknowledge whether he was familiar with the exact scheme I was describing. I couldn’t dissuade these young ladies and many others from using the compromised machine on my second evening at the hotel. I showed the hotel folks the bluetooth beacons emanating from the ATMs in the lobby, and showed them how to conduct the same scans on their phones. Everyone roundly agreed that the technician had to be called again. But there were two ATMs in the lobby — one dispensing Mexican Pesos and another dispensing only dollars. How to know which ATM is compromised, they asked? Unplug them one by one, I replied, and you’ll see very quickly which cash machine is hacked because the bluetooth beacon would shut off. Despite more head nods and a round of verbal agreement from the hotel staff that this was a good idea, to my surprise nobody at the hotel bothered to touch the machine for two more days. I watched countless people withdraw money from the hacked ATM; some of those I warned while in the lobby were appreciative and seemed to grasp that perhaps it was best to wait for another ATM; others were less receptive and continued with their transactions. The next morning — after verifying that the hotel’s ATM was still compromised and trying in vain to hail the security folks again at the hotel — I headed out in the rental car. 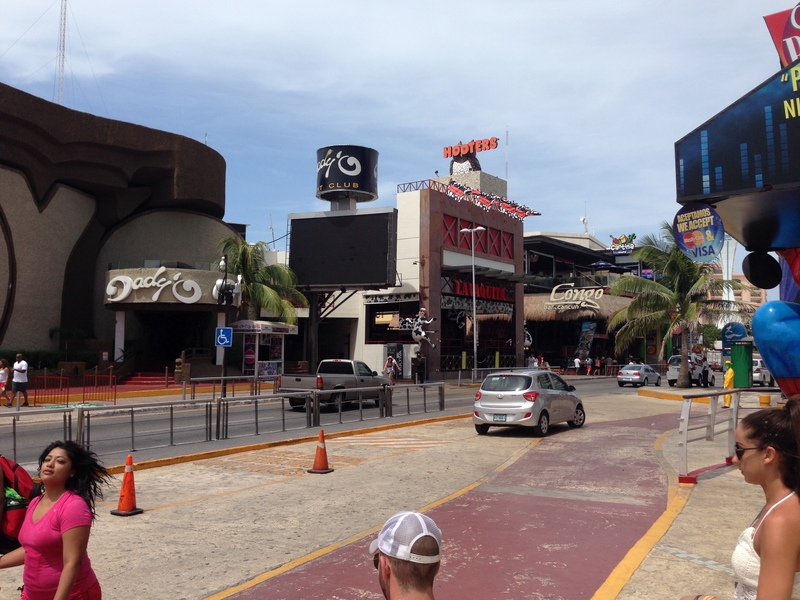 I was eager to visit some of the other more popular tourist destinations about an hour to the south of Cancun, including Playa del Carmen, Tulum and Cozumel. I wanted to see how many of those towns were hacked by this same skimming crew. I was about to learn that the true scope of this scam was far larger than I’d imagined. This entry was posted on Monday, September 14th, 2015 at 12:03 am	and is filed under A Little Sunshine, All About Skimmers. You can follow any comments to this entry through the RSS 2.0 feed. Both comments and pings are currently closed. I have been living in Mexico full time for the last 14 years. For the very reason mentioned in this article I have never used a credit card in Mexico for a purchase be it a restaurant, store and definitely never an ATM. As a B&B owner I also advise my guests against using their cards in Mexico. This scam has been going on forever. It’s just getting more and more sophisticated. Just curious what you do recommend your guests to use for money when they are in Mexico on vacation. It is dangerous to carry large amounts of cash with you that you would need for long stays when you are travelling and most guests would not have accounts at mexican banks. We come to Mexico (Puerto Vallarta area) yearly for 5 weeks and have started bring mainly pesos for our vacation from Canada but still have to go to bank ATM’s the last couple of weeks of our holiday as I do not want to carry $5000 canadian on me. We started doing this after our debit cards were compromised a couple of years ago. Any suggestions on how to bring money or get it while in Mexico would be great! I would recommend using your beaver. Setup a second, temporary, bank account where you can put travel funds. then when you get back close the account. If you set up a Travel account then close the account when you get back… the other side of this coin is that the closed bank account will be reported to credit bureau… whether you closed it or the bank did. I would go to a bank and buy a Visa Travel Card and load the card with up to $5000. The funds you don’t spend can be taken out at any ATM and redeposited to you Bank account. Great work on this subject! Question: Do you know why your iPhone Bluetooth was not able to pick the signal from the ATM machine in Mexico. You mentioned that you had to pick up a cheap $100 phone while you were down there and that phone was able to detect the signal. Just curious. Thank you for you work on this. Wish I knew, Tony. It wasn’t just the iPhone. Couldn’t pick them up reliably on my iPad either. 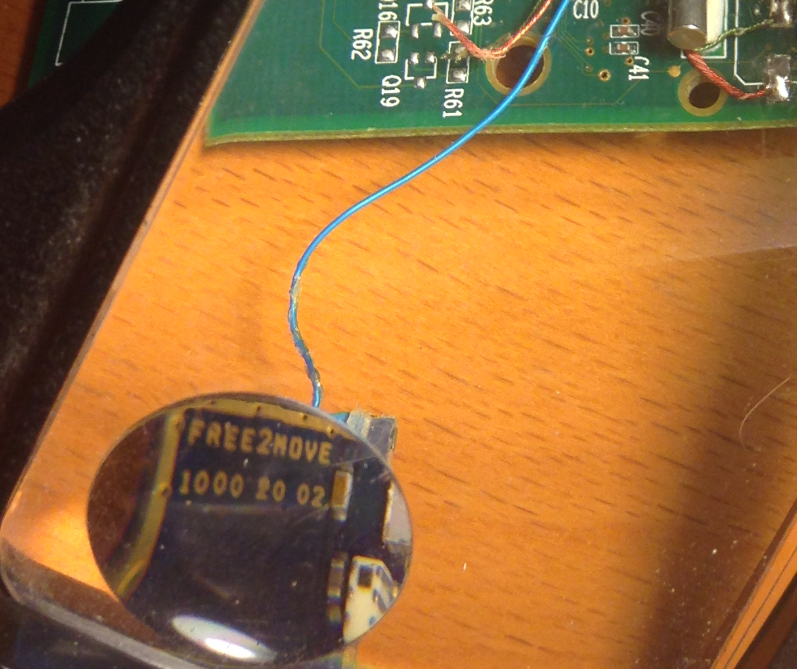 iPhone 5 should be able to read Bluetooth classic and Bluetooth Low Energy (AKA BLE or Bluetooth Smart). But iPhone’s BLE implementation is kind of proprietary and uses Apple’s own iBeacon standard. So it’s possible that the device is using a generic form of BLE that isn’t readable by iPhone but is readable by Android. You would have to use a Bluetooth Classic or BLE sniffer to analyze the packets. You’d have to use something like an Ubertooth One. Great article. I live in Mexico and use the ATM’s, as the banks here are insanely crowded and time consuming. Wondering if you could email me or do a quick post on how to scan ATM’s for bluetooth beacons. Or do you just turn on Bluetooth and look for devices? Turn on the bluetooth on your device (phone/tablet), then search for a bluetooth signal while being close to the ATM… if your phone shows a ‘bluetooth’ signal that reads ‘Free2Move’, well, there’s a good chance the ATM is compromised. It’s very simple. Virtually every smart phone — Android or iOS — has a bluetooth scanner built-in. You just go to your settings page for the device, and look for a listing called “Bluetooth.” There should be a “scan” button. Click that. Do you feel the skimmers will now move to unannounced bluetooth networks? Civic-minded geeks might want to try the same kinds of scans in the USA, to see if any of their local ATMs are similarly infected. This seems simple enough to do, that high school kids could do it. Someone could offer a prize to whoever finds the largest number of them in a month. A small jamming device would possibly be removable from an ATM, and would also serve as an extreme annoying to people reliant on Bluetooth headsets and hearing aids. It could probably be limited, somehow, but jamming Bluetooth signals sounds like putting duct-tape on a steel pipe to stop it from leaking — impractical in the long run. Actually this could be solved by making the outside of the ATM a Faraday cage. No electronic signal can get through. It is (very near) impossible to make a faraday cage that blocks all electronic signals – certainly as the shell of an ATM it would be very problematic. Generally a given cage only blocks a certain frequency range, and it would be a design challenge (and additional operational cost, given that you would have to provide a not-insignificant charge for any effectiveness). You could (maybe) block say bluetooth and wifi, but someone could move down to a very low power lower frequency radio that would pass through without any difficulty. Even “blocking” something like bluetooth or wifi would be difficult – all a faraday cage does to radio waves is cause significant signal attenuation, so if you were operating an inch from your transmitter (e.g. directly on the other side of the enclosure), it would be difficult to completely block that signal. Jamming or a Faraday cage wouldn’t prevent your card from being skimmed, it would just make it more difficult for the thieves to extract the information. The Bluetooth is used to download the data from the scanner in batches, it’s not a real-time transmission as the card is scanned. The criminals should have done a challenge/response system: send a specific message broadband that activates the download so the BT beacon isn’t being constantly sent, but then you give up your 1x2cm form factor. The BT beacon is probably the easiest way to do things, you could sit down in a hotel lobby or on a bench on the street and inconspicuously download multiple compromised ATMs. Hi I am also at Cancun, would likes to talk about other suspect in copyng crédit cards info. You have my mail. Great article, is there a published list of known “skimmer” Bluetooth IDs like Free2Move? I know it is easy to change it but not in all cases. Great articles Brian. I’ve read all three but chose to comment here because this is where you mentioned going to hotel security and letting them know their ATM’s were being skimmed. Don’t you think, if they had been bribed by the bad guys, you might have been putting your life in danger by letting them know you had come upon the scam? You’re a smart guy, but I hope not too naive on occaison. Be careful! Investigative reporting carries some risk, and there is little way to avoid that. I judged the risk to be minimal in this case, in part because if anything happened to me there the hotel would likely suffer a pretty big hit in terms of tourism. But that’s part of the reason why I included so many different staff members from the hotel. The more people involved, the greater the chance that if someone was on the take that they’d be in the loop, but also generally speaking the more people who know about it the safer it is for the reporter of the problem. As long as you weighed the risks Brian. You were operating in a country where Law Enforcement can be corrupt which can put you at grave risk. Keep the stories coming! Are these Bluetooth skimmers able to obtain PIN information? I have always covered my hand when entering the PIN under the belief a small camera had to be used in addition to the skimmer in order to obtain the PIN. I spend a good deal of time in Brasil, and must call my bank each time I am going to use an ATM. A lot of recent ATM theft incidents have been of the brute force type, using a backhoe to physically break open the ATM, gather the cash, then run. But, a Bluetooth skimmer was found at the international airport a few months ago, and I suspect they will spread quickly as the Olympics approach. Just read Part2 of this series, and see that you have covered how the PIN is obtained using a separate Bluetooth device. Thanks. Is any additional technical info available ie: power requirements, Encryption specs, power output, specific frequencies, exact size, etc. Based on some of the technical info you presented about passwords and encryption it sounds like you had some engineering assistance. Can you provide any additional info you have on the technical analysis or point us to whoever assisted in the reverse engineering so we can work on an automatic detection system or some type of jamming system for these types of devices? I might be able to assist you with that. Perhaps Brian can send you my email address. Does the phone have to be running on a local (Mexican) network for this to work? i.e. I probably just can’t switch my US phone to discovery mode and see the bluetooth networks show up? I’m wondering if we know whether ‘skimming’ is present on ATMs in Merida or Valladolid? Has anyone tested them? If so, which ATMs were found to be safe? I visit there every year and some hotels require cash payment, which leads me to use local ATMs. An alternative would be to bring sufficient cash from the US to pay my hotel bills, but that means carrying around lots of money — not a good idea. My family and I stayed at the CasaMagna Marriott in Cancun a few months ago, in mid-May of this year, and I used that EXACT ATM to withdraw local Mx currency on a couple of occasions. You can imagine my shock and dismay in reading your article & seeing your video. I thankfully don’t recall any bogus charges or withdrawals on the debit card I used…I receive an email with each transaction so I’m pretty sure that one didn’t fall through the cracks. On one occasion a few years back an unauthorized withdrawal was made at an ATM in Panama using my European credit card data (I’ve never even been to Panama)…so I guess that I was a victim of a skimmer as a PIN was needed to make that unauthorized transaction. Thankfully my bank honored my fraud report and replaced the funds stolen. I’m glad I came across your website through a post on facebook, very informative! Thanks for doing what you do. If you have any concerns about your card potentially being compromised I strongly recommend that you contact your bank and request a new card. Sometimes card skimmers hold onto the card data for a long period of time before using the info just to throw people off their trail. Banks will almost always replace your card for free if you suspect fraud.